Summary: When a fleshless corpse is found on a Florida estate, a reclusive caretaker, an investigative reporter, a police officer, and a woman discover that a creature whose victims die in a frenzied state of sexual ecstasy is preying on human beings. 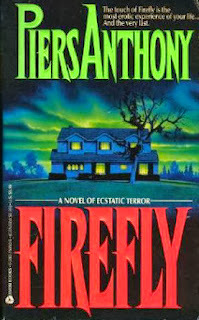 Review: All right, so Piers Anthony is long established, and this book has been out for years and years, too. So why am I reviewing it? Well, first of all, I think it's important to talk about past books too, whether we loved or hated them. The wonder and magic of books is that they stay around - look at examples like Pride and Prejudice, after all. Books have the power to be read and influence people far into the future. So I think it's important that I touch on this book because to be honest, when I think about it, it just might be about one of the most disturbing books I've ever read. I read it when I was a young teenager and at the time I didn't have a problem with it, but now, thinking back, I am incredibly disturbed as an adult that the book even exists. The whole book comes across merely as a vehicle for Anthony's sexual fantasies. This is actually a common theme through his books, I am thinking, and I may do other reviews to touch on this as well. In any event, a large part of the book - far too much of it, in my opinion - is devoted to descriptions of this creature overpowering people, which thus necessitates describing their reactions and orgasms in pornographic detail. The worst part, however, is that the book contains a description of a sexual scene with a young child, and that is what really revolts me about this book. How it was ever seen as fit to publish, I do not know, considering that it has graphic descriptions of pedophilia and child abuse. I would not recommend this book for anyone.